For more than forty years research studies have indicated that hypnotherapy can be an effective means of helping asthmatic patients control, reduce and in some cases, eliminate their condition. Anyone who suffers from asthma, or has a relative or friend with the condition, knows how serious it can be – and how widespread. In the United Kingdom it is estimated that over five million people receive treatment for asthma with around 20 per cent of households having someone diagnosed as asthmatic. 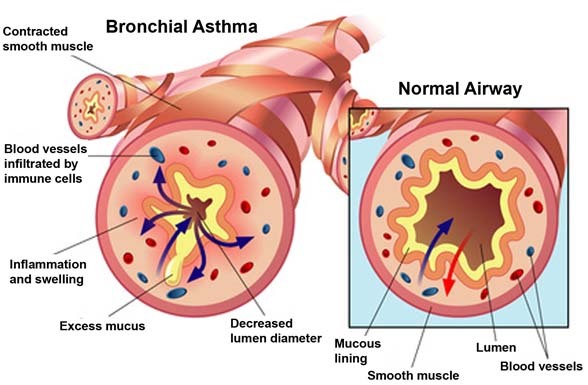 The condition affects the respiratory system when the muscles around the airway walls tighten and narrow with the lining of the small airways to the lungs – the bronchioles – becoming inflamed and swollen. This results in difficulty breathing and symptoms include coughing, wheezing, tight feelings in the chest and breathlessness. It is important that anyone who develops a respiratory problem consult their GP for a proper diagnosis. If asthma is confirmed one of the five commonly used groups of drugs administered by an inhaler will probably be prescribed, while in severe cases tablets containing steroids may also be taken by mouth. But asthma patients do not have to rely on drugs alone to develop an increased sense of being "in control" of their condition. To many the effectiveness of hypnotherapy may seem surprising as asthma is often – but not always – a response to triggers such as dust, animals, pollen, mites, weather conditions, fumes or certain foods. Sometimes the condition is categorised into “extrinsic” and “intrinsic” asthmas. Extrinsic asthma is when the immune system responses to external allergens of one sort or another. Intrinsic asthma is when the trigger is anything except an allergy – including factors such as stress, arguments, social occasions even laughter. The trigger can be psychosomatic which might best be defined as a physical condition influenced by psychological or emotional factors. Many patients know, from many previous occasions, that in certain conditions they are likely to experience an asthmatic episode, and so have built up an expectation of an attack. People with asthma become attuned to the warning signals, frequently it is at an unconscious level that they first “spot the signs”, and without consciously knowing it, respond by changing their breathing pattern. They begin to breath more rapidly and more shallowly. In other words, they respond by starting to hyperventilate. The model of therapy which the Therapy Partnership has developed for asthma patients – based largely on a four and a half year study conducted at Battle Hospital, Reading – puts the patient back in control. It does this in a number of ways, including altering the patients’ expectation and developing an understanding that they have the means to remain calm and bring their breathing back into control. An important part of this protocol is the teaching of self-hypnosis with patients encouraged to practise between sessions, linked to specific positive suggestions. Other procedures are also used to help patients develop a deeply ingrained knowledge and expectation that in the event of an asthmatic incident they will remain calm and be able respond and deal with it appropriately. PLEASE NOTE: The Therapy Partnership can only provide therapy for asthma patients if their condition is being treated or monitored by their own GP or an asthma clinic. It is also our practise to write to the doctors concerned informing them that hypnotherapy is being provided to their patients and subsequently keeping them informed of the progress made.